For those not familiar with Texas geography, Maydelle is about 125 miles southeast of Dallas, and 175 miles north of Houston. We have a store with gas pumps, a cafe, and a post office, and that's about it! The Texas State Railroad, an old-timey steam engine tourist train passes through town. See their website for information and tickets. Old Farmhouse Pottery is one mile west of Maydelle, just off Highway 84. You can't miss the sign. 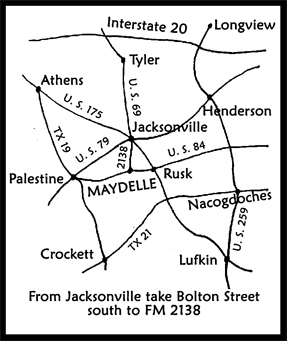 From Jacksonville, take Bolton Street south to Farm Road 2138, which will take you to Maydelle. Bolton Street is parallel to, and a few blocks west of, Highway 69. Old Farmhouse Pottery is usually open from 10:00 to 5:00 p.m. You are welcome to stop by any time if you find yourself in the neighborhood. However, if you are making a special trip to the shop, it is much better to call or e-mail first to make sure we will be here when you want to visit, because we are sometimes away at pottery workshops or sales. And even potters need some time off now and then!